In the early morning hours of May 20, 2006, the eruption at the Soufriere Hills Volcano on Montserrat Island in the Caribbean escalated from intermittent ash plumes to an explosive eruption as the volcano’s collapsing lava dome shed about 90 million cubic meters of rock in less than three hours, reported the Montserrat Volcano Observatory. Avalanches of ash, mud, and rock mingled with heavy rain and rushed down river valleys into the ocean. 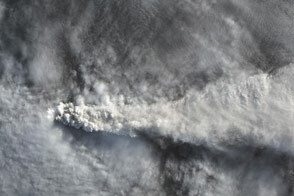 The eruption also sent a cloud of ash and volcanic gas nearly 17 kilometers (55,000 feet) into the atmosphere. Flying on NASA’s Aqua satellite, the Atmospheric Infrared Sounder (AIRS) tracked the cloud as it drifted west over the Caribbean Sea and Central America. Among the gases mixed in the ash cloud was sulfur dioxide, one of the gases that AIRS detects as it measures the composition of the atmosphere. AIRS measured high levels of sulfur dioxide west of the volcano as the sensor passed over the region during three consecutive overpasses on May 21, May 22, and May 23. In this image, the highest concentrations of sulfur dioxide are red, while the lowest concentrations are pale purple. (The scale is logarithmic, in which the numbers represent an exponential increase in concentration. On this scale, the exponential increase makes the sulfur dioxide concentrations at the top end of this scale not just 4.5 times bigger than the concentration at the low end, but more than 33 times bigger.) Though the gas slowly dissipated between measurements, the center of the cloud still contained a high concentration of sulfur dioxide on May 23. Aside from irritating the eyes and nose, making breathing difficult, and having a strong smell, sulfur dioxide can impact climate. Once in the atmosphere, chemical reactions (oxidation) turn sulfur dioxide into sulfate aerosol particles that create a bright haze that reflects sunlight back into space. Since less sunlight reaches the Earth, the sulfate aerosols have a cooling effect on the climate. The effect is typically regional, but if enough of the gas reaches high into the stratosphere, the part of the atmosphere that is 20 to 50 kilometers above the surface of the Earth, temperatures around the world can drop. AIRS was built to help scientists gain a better understanding of weather and climate, including how gases like sulfur dioxide and the aerosols they produce impact temperatures and weather patterns. The instrument measures air temperature, humidity, clouds, surface temperature, and atmospheric composition—all components of the atmosphere that influence weather and climate. Light plumes of ash drifted from the Soufriere Hills Volcano on the island of Montserrat throughout early 2006. The volcano erupted again in the spring, and continued erupting during the summer.